Emotional Freedom Technique", or EFT for short, is a powerful method that uses your body's natural bio-electrical circuitry, to stimulate the desired outcomes. 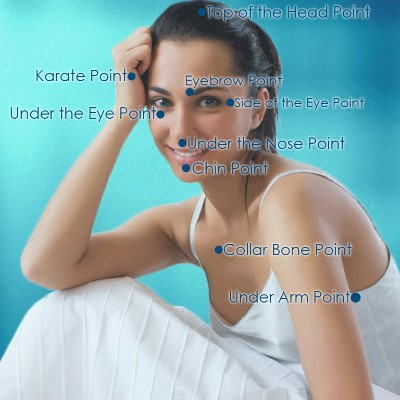 EFT tapping system is a close relative to Acupuncture and Acupressure (except EFT doesn't use any needles, just gentle finger tapping) and works on the same principles and on the same meridian system of the body. The technique involves identifying a specific negative feeling which created a blockage in the body and mind, thus preventing a natural flow of energy. While focusing on the emotion or situation, an individual taps on specific points of the body which creates a disturbance in the energy system, thus quickly lessening the negative feeling and reducing its impact on the body. After few rounds, positive emotions and affirmations are tapped into the body which then balance the body's energetic system and provide a healthier outlook on a situation. EFT has been around since 1980's, originally founded by a psychologist Dr. Roger Callaghan who focused his studies at that time on Thought Field Therapy. Since Dr. Callaghan also studied Traditional Chinese medicine and acupuncture he decided to use finger tapping on certain meridian points of the body in order to alleviate anxiety and pain in his clients. The results were astonishing and his research continued for many years. In the early 1990's Gary Craig, Dr. Calaghan's student, formulated the tapping sequence to cover most of the major meridians connected to the organs. It is Gary Craig's tapping sequence that is used today to treat and eliminate every type of condition. EFT is gaining serious popularity as a therapeutic practice, accepted by the American Psychological Association, and has even been shown to be more effective and achieve results far faster than traditional therapy. It is being used by healthcare professionals in hospitals, teachers in classrooms, psychologists and therapists in their own professional practices, etc. The power and effectiveness of Emotional Freedom Technique is revolutionary.